Mahindra has officially launched the new e2o electric car in the UK with prices starting at 12,995 Pounds (approx. Rs.12.25 lakh) for the base trim. The three-door, four-seater all-electric car is available in two trims - City as well as TechX, and comes with a host of upgrades over the India spec model. The Mahindra e2o is also twice as expensive as the Indian version being exported as a CBU and can be seen as the successor to the G-Wiz (Reva in India), which was previously sold in the Albion. Deliveries for the e2o will commence in May this year. The Mahindra e2o will be primarily rivaling the likes of Renault Twizy and Peugeot iOn in the UK and is priced at a significant premium over rivals. The electric car will also lock horns with the more premium Nissan Leaf. The e2o has Facilities include rapid charging, telematics, smartphone app, touchscreen infotainment center and remote controlled Revive emergency charging. The Mahindra e2o, specially designed for easy commuting into the city and equipped with a variety of related technologies, is available in two trim levels. The starting price of e2o City is extremely competitive. The more sophisticated TechX version is equipped with a touchscreen infotainment center with rear view camera, telematics, remote controlled Revive emergency charging, leather seats, alloy wheels and a quick charge port. 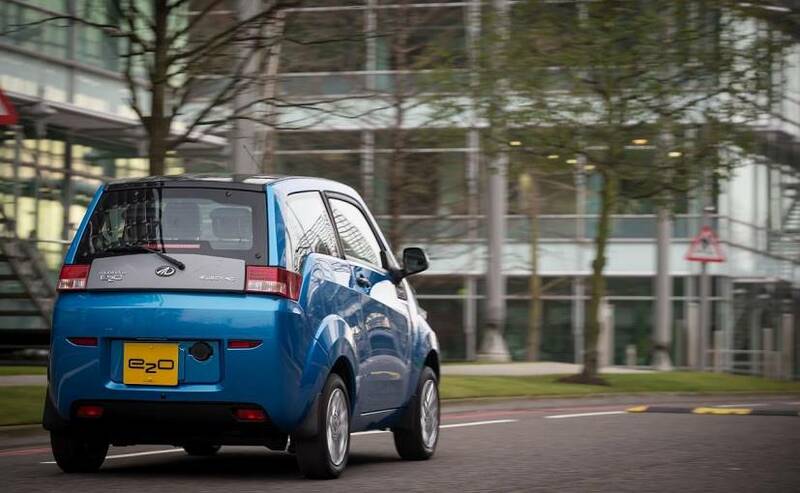 In addition to its competitive price to e2o owners who drive in GB average of 7900 miles per year and charge the car at a discount rate "Economy 7" overnight, may rejoice that it is less than £ 10 per month spend on fuel, with simultaneous elimination of air pollutants in their city. 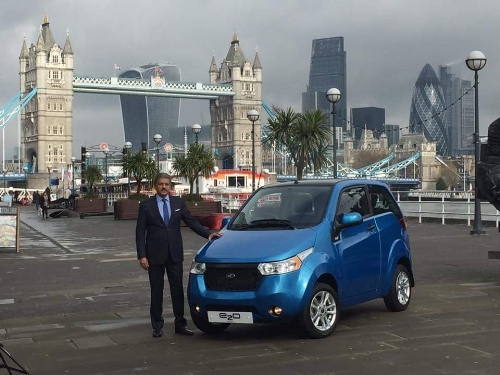 To the arrival of e2o on British roads says Anand Mahindra, Chairman of Mahindra Group: "I am very proud to announce that the e2o now in GB stands for the sale are available, and this is a real milestone for the Mahindra Group. sustainability is at the business practices of Mahindra in the foreground and the e2o-introduction in the UK market, we have a product that matches our corporate philosophy perfectly to the point." With the launch of e2o said the mayor of London , Boris Johnson MP: "I want to congratulate to the introduction of their electric cars Mahindra today Support ultra low emission vehicles has long been a priority at City Hall because they improve air quality, combat climate change save and fuel costs; and I am looking forward to seeing the e2os on the streets of London". e2o Remote™ smartphone app - enables users important functions of their e2o to control by remote control, including the ability to heat the car in advance / cool to start the charging process or terminate, to plan a route and find charging stations nearby. Remote Charging Scheduler™ - a very clever app that allows users to recharge your e2o time set so that the tariffs of electricity costs are lowest. Revive™ - remote emergency charge function that provides the driver with a distance of up to 8 miles, when the battery is empty. Telematics - on-board sensors send data "heartbeat" to Mahindra, the monitoring of health allows, and sending alarm messages to the customer. Blaupunkt touchscreen infotainment center (only when TechX model) - Satellite navigation with maps which display the "remaining range" and Aufladestandorte Bluetooth, Wi-Fi hotspot connection, USB, SD card, DAB radio and a built-in reversing camera.